“Ypsi is the Brooklyn to Ann Arbor’s Manhattan”… or so I’ve heard. What’s meant by that, I suppose, is that despite Ann Arbor’s reputation as a cultural mecca, the increase in real estate prices and taxes over the last few decades has driven artists and creatives of all kinds to relocate from Ann Arbor to cheaper digs in neighboring Ypsilanti. A vibrant underground arts scene has emerged there recently and I got a chance to at least start exploring it by visiting Ypsi Alloy Studio Collective during First Friday’s monthly crawl of studios and galleries. Ypsi Alloy Studio Collective is a new kind of art animal, part open studio, part maker space. It’s located in a big warehouse- type building in an industrial park on the outskirts of town. The artists share space, tools, utility costs and inspiration. I was immediately struck by the collegial atmosphere. All the artists, most of whom are graduates of Eastern Michigan University, (5 of 12 were in attendance) are very focused on the making of objects that occupy the intersection of craft and fine art. The zeitgeist of southeastern Michigan is still very much one of the manufacturing of things and these graduates of Eastern Michigan University’s Art Department seem to reflect that. I knew only one of the artists going in: Jessica Tenbusch, a metalsmith and sculptor with whom I had shown work at the Walter E. Terhune Gallery in Perrysburg, Ohio, earlier this year. Jessica was awarded a prize for her sculpture, no doubt the first of many honors to come. 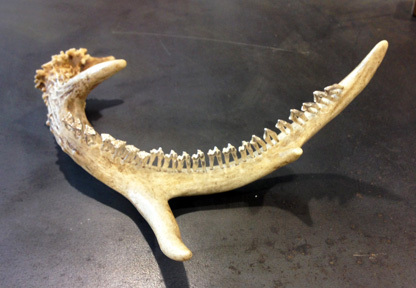 In her art practice, Tenbusch combines silver metalwork and found natural objects such as bones, antlers, animals preserved in resin and the like. You can see more of her art here. Her work is mostly small scale, reflecting the size of the natural objects she incorporates into her sculptures. Her objects and silver jewelry evoke her interest in the interplay between life and death in the natural world. 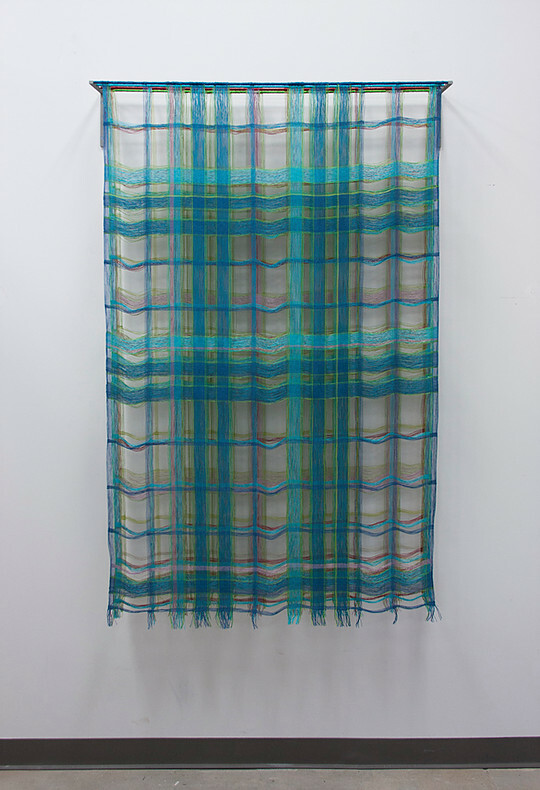 I had an interesting conversation with Cathy Jacobs about her journey from painter to fiber artist; One particularly thoughtful piece was Window in Aqua, a series of handwoven translucent scrims suspended from a wooden framework. The artwork is meant to be both seen and seen through. I was also impressed by the furniture of Lauren Mleczko and Molly Doak of Lomo Collective. They make furniture from an inventive array of re-purposed chair parts, laminated plywood and found woods, sometimes going so far as to hand weave and dye the fabrics they employ in their upholstery. Plenty of art remains still to be seen in Ypsilanti (I barely scratched the surface), but I will have to wait until the next First Friday in July. And I’m looking forward to seeing the work of the other 9 artists at Ypsi Alloy Studio Collective soon.